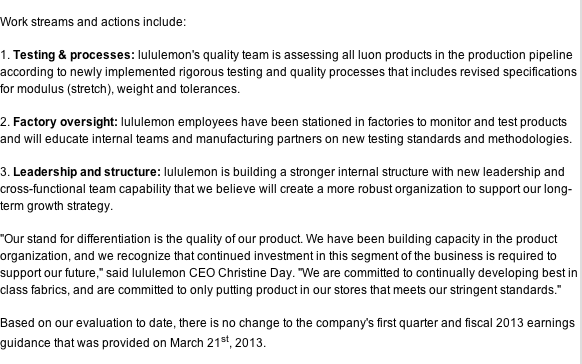 Lululemon announced this afternoon that Sheree Waterson has been removed as Chief Product Officer, effective April 15, 2013, right on the heels of the Luon recall in March. I’m a bit surprised that Sheree Waterson was eliminated as she has 25 years of experience in the consumer and retail industry. What I expected as a solution was that the captain of the ship who has proven herself to have zero experience in the garment industry would step down. Whatever the change, I hope this is a sign of drastic return back to the quality and sophisticated designs and materials that lululemon used to be (before their nose dive in quality). What are your thoughts on this ‘organizational change‘ announcement? 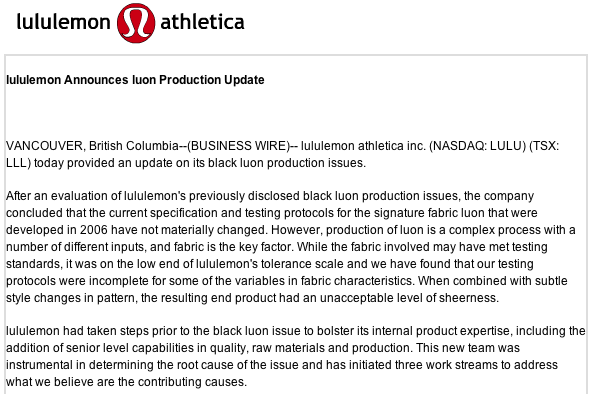 Another press release today, Lululemon Announces Luon Product Update, was a little vague and lacking in any clarity as to what went wrong with luon. It also fails to acknowledge any change in luon recipe when we KNOW that luon is not always Nylon Lycra (87% Nylon and 13% Lycra to be exact). It has varied from perfect luon which was thick Nylon Lycra, to blends with polyester, to up to 98% polyester which is not at all Luon to my mind. The name luon is simply a loose marketing name and does not indicate a specific blend of fabric. I wish they would rename their polyester based fabrics as something other than luon because it’s baffling when you ask an employee why two different tanks labelled luon feel completely different and they try to tell you the recipe is identical between the two as it always has been (despite the fabric content label telling me otherwise). Hmmmmmmmm. Did you find this press release at all informative? "The Latest: Vinyasa Surf Tank, Throw Me Over Hoodie, Work It Out Track Pant and More"
"Very Green Power Y is Made In Canada!"